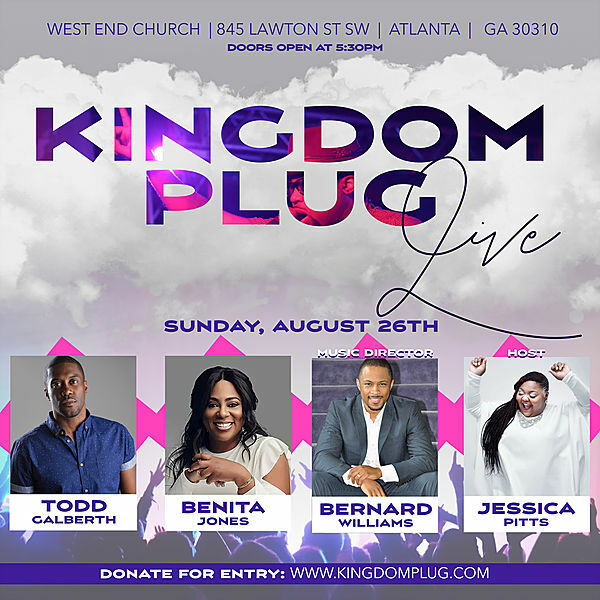 Kingdom Plug is holding its quarterly Kingdom Plug Live event on Sunday, August 26th at West End Church in Atlanta. While Kingdom Plug Live features some of the most dynamic praise and worship artists around, it is much more than just another Gospel concert. Kingdom Plug Live brings people together to celebrate and worship God while providing valuable life resources and information about Health & Wellness, Financial Management, and more. There is no ticket price, but donations for entry are taken. Part of the proceeds go towards Kingdom Plug‘s year-round outreach where they take hot meals and toiletries to Atlanta’s homeless population. Frank and La Keisha Johnson founded Kingdom Plug to provide valuable resources to the business and faith communities, and co-labor to bring this event together. “We are looking to influence culture and influence people to become givers. We truly believe that everyone deserves a second chance and that the Kingdom of God can make these second chances happen,” shares Kingdom Plug founders Frank and La Keisha Johnson. Kingdom Plug Live 2018 will be hosted by Jessica Pitts. The powerful artist lineup features Benita Jones, Director of Worship at All Nations Worship Assembly Atlanta; Todd Galberth, Worship Arts Pastor at Relentless Church in Greenville, South Carolina, and Bernard Williams, Minister of Worship Arts at Linked Up Church in Marietta. Kingdom Plug Live 2018 takes place at West End Church, 845 Lawton Street, Atlanta, Georgia. Doors open at 5:30 p.m.
For more information and to make a donation, go to www.kingdomplug.com. You can also donate by texting the word GIVE to 912.274.8614. This entry was posted in News, Press and tagged Atlanta, Benita Jones, Bernard Williams, homeless, Kingdom Plug, Kingdom Plug Live, Todd Galberth. Bookmark the permalink. Trackbacks are closed, but you can post a comment.